N E W! Bilingual Kelly Bear FEELINGS book is now available! Playing this cooperative game promotes children's self-understanding, character development, and positive peer interactions. 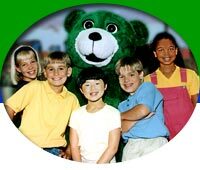 Each of the 10 DVDs features a life-size green bear named Kelly, who serves as a role model and teacher to five curious children. In the three Violence Prevention DVDs Kelly helps children deal with bullying, resolve disputes, and use self-control. The Kelly Bear C.A.R.E.S Program (ages 5-9) with Instructional Guide, forms, handouts, plus 6 books, 10 videos, song CD, and the "Help Kelly Bear" game. 29 songs, most of which are to familiar tunes, performed by Don Monopoli and children from The Learning Station on a 60-minute CD. All lyrics included. Songs are from all 10 character-building videos. 10 sample songs on details page.